It was October 2, 2015 and the sun was shining bright in Sunny Isles Beach, Florida. Construction on the 34-story luxury condo, Chateau Beach Residences, was in the final stages of transition to the owners. Workers from many trades hurriedly finalized their punch list items in order to meet the looming deadlines. Like all construction projects of this size and tight budget, delays and overruns create obstacles that must be overcome. It’s during these stressful times when potential errors in judgment can happen, resulting in hazardous conditions that can kill. 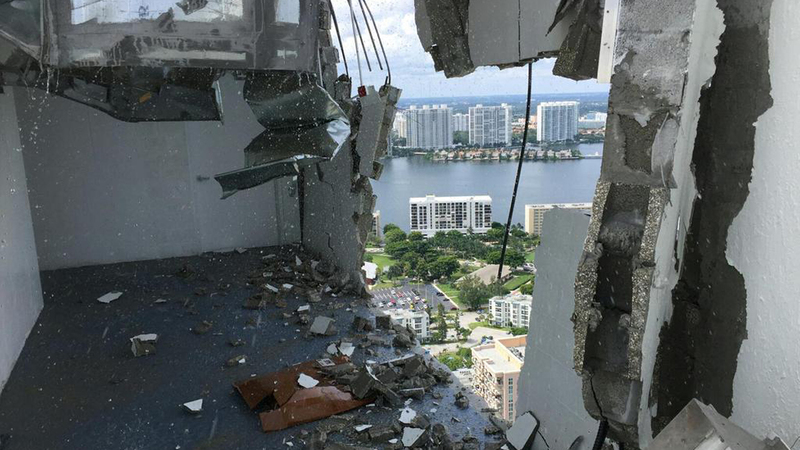 At approximately 11:35 that morning a massive explosion ripped through the multi-million dollar 8000 sq ft penthouse condo, sending debris hundreds of feet through the air and down to the busy street below. The blast wave was so intense that it blew the doors off the lobby level stairwells over 350 ft below, shattering the steel frames. The adjacent hotel with guests sun bathing at the rooftop pool were pummeled with glass, concrete and stucco causing several injuries. 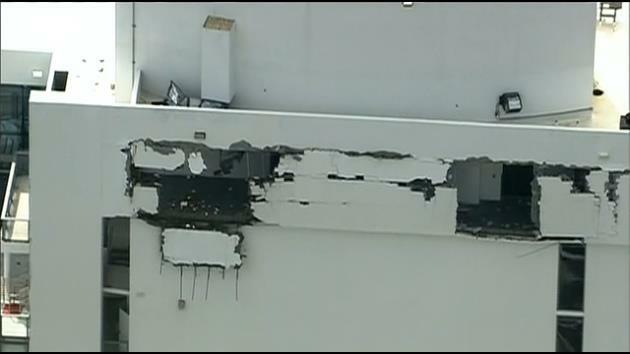 The hotel was forced to close for several days so that cleanup and safety inspections could be conducted. During that brief instant, personal safety became the most important thing in hundreds of people’s minds; more important than schedules, their paycheck and certainly the coffee they may have been enjoying that morning. The explosion is suspected to be the result of a gas leak in the piping that fed the condo’s rooftop boilers. While the investigation is still ongoing by OSHA and other agencies, it’s only natural to question the cause of this disruptive event and further inquire if it could have been prevented. It’s a miracle no one was killed, but several people were severely injured and rushed to a nearby hospital where they have all since recovered. The life safety and fire detection system in the facility worked immediately, and executed its pre-programmed emergency response to the initial alarm from the heat detector located in the mechanical room where the boilers were located. Authorities were notified and occupants evacuated safely; everything worked as designed (including people taking action and leaving in an orderly fashion). That may be the only time this system will ever be needed for the next twenty years, but it was worth every penny in this one event where lives were saved and damage was minimized. • Accidents are inevitable, codes are adopted and enforced in order to learn from our mistakes and limit the loss of life and property. • Company safety policies and procedures are enhanced and refined over time. It’s good practice to find the chinks in the armor and make it stronger. • All of these efforts are meant to reduce injury while mitigating normal risks present on every project. Job site safety is no accident! Space Age Electronics continues to innovate new technologies that make systems safer while improving worker and occupant safety. SAE is once again leading the industry with early construction safety as outlined in NFPA 241. This small chapter of the National Fire Protection Code details the requirements for Temporary Power/Lighting systems, Extinguishing Units and Emergency Notification for all new construction projects. Never before has the construction industry been able to address these three new construction threats to safety with a single UL listed system. Professional products for a code compliant solution that’s budget conscience made simple and easy to use makes job site safety a whole lot better. 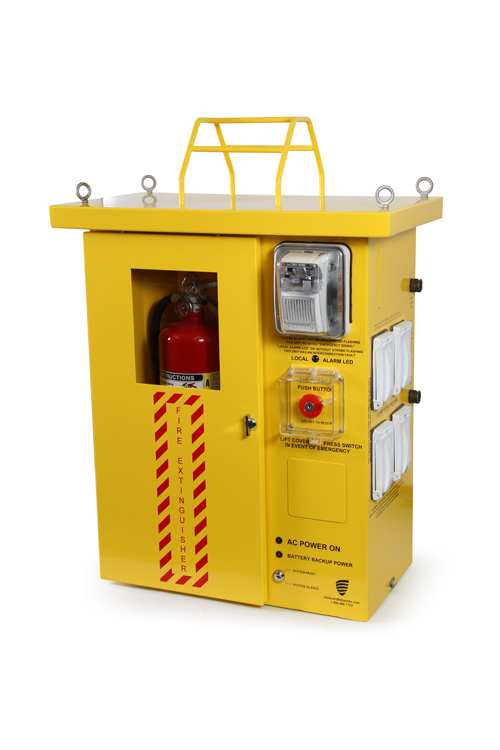 The ECS Power Box, a product of Lifeguard Networks by Space Age Electronics, delivers all three services at an affordable price. General Contractors and Electrical Contractors now have the convenience available to install a temporary power system throughout their project providing ground fault protected on the electrical system inside all NEMA 3R rated enclosures. 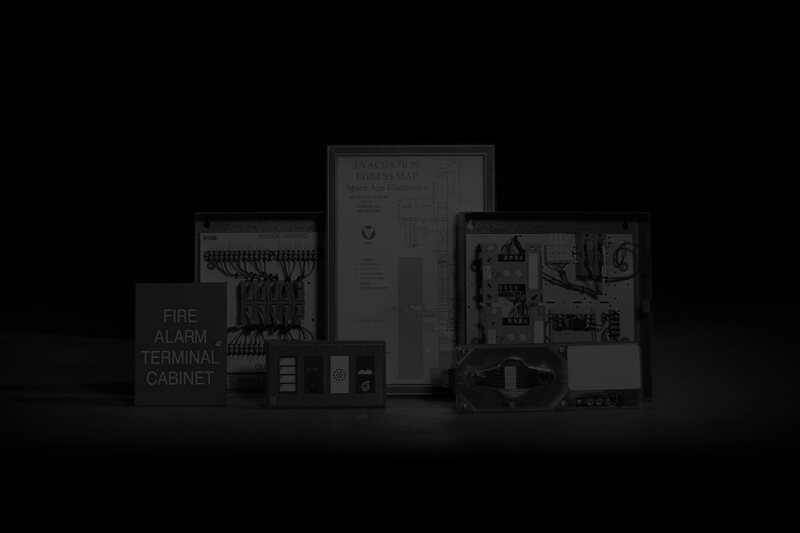 This highly visible cabinet provides fire extinguisher storage with emergency LED lighting for easy identification in the dark. Additionally a site wide emergency notification system comprised of electronic sounders and zenon strobes with an emergency activation button all backed up with 72hrs of battery power. This fully scalable solution can also monitor site specific hazards and provide off-site notification via wireless IP technology. One significant advantage of the ECS Power Box system is its durable design. The system can be re-used from project to project and mobilized or stored very easily. This means your ROI is achieved within two or three projects based on budgets for the temporary power and lighting that was allocated. Deployment is also fast; units can be setup in a matter of minutes and minimal training is required on how to use the system. Literally connect them together with the pre-engineered cables and you’re ready to go. No programming or commissioning necessary, plug and go. Check out these links to see this system in action and learn more about the LifeGuard Networks ECS Power Box. If you feel your work place safety can be better and the safety of your workers and your livelihood is the most important thing, let us help you delivery those solutions to your customers, in the end we all win. ← The Legacy of an American Dream!